Today, the Supreme Court of India passed a judgment in favour of PETA India by ordering the implementation of a 7 April 2014 Bombay High Court order to release the well-known and much-abused young elephant Sunder to an elephant care centre in Bangalore by no later than 15 June. The Supreme Court also ordered that the Secretary, Revenue and Forests Department, Maharashtra State will be responsible for the implementation of its order and must strictly meet the deadline. This decision is supported by celebrities Paul McCartney, Amitabh Bachchan, Celina Jaitly, Madhuri Dixit, Pamela Anderson, Arjun Rampal, R Madhavan, Gulshan Grover and many others who took to Twitter, met with concerned government officials and helped in other ways with the campaign for his release. The court dismissed the Special Leave Petition filed by Ministry of the Legislative Assembly Vinay Kore, who had given Sunder as a “gift” to the Jyotiba temple in Kolhapur. M/s K Ashar & Co Advocates & Solicitors were the advocates on record for PETA, and the group was represented in the matter by Senior Counsel Raj Panjwani. The Jyotiba temple came into possession of Sunder in 2007, but after cruelty such as the use of spiked chains and beatings, came to light, the Maharashtra Minister of Forests Dr Patangrao Kadam (on 21 August 2012) and the Project Elephant division of the Ministry of Environment and Forests (on 9 November 2012) issued orders for Sunder’s rescue. However, they were never carried out, and Sunder was then spirited away at the behest of Kore and hidden in an old poultry shed, where he continued to be beaten and was so heavily chained that he recently sustained a serious injury on his leg. Congratulations to everyone who helped with the #FreeSunder campaign! It was an enormous effort with a wonderful result. Sunder is now at his new home, as per the order of the Supreme Court. Sunder has a terrible injury on his leg from being chained too tightly for a long time. It is no doubt painful to him. Bannerghatta Biological Park (BBP) veterinarians and handlers say that initially Sunder will need to be kept lightly restrained until the injury is brought under control and has healed and until he gets to know the other elephants and the caretakers. He needs to trust that unlike his previous “caretakers” and mahout (handler), they are not out to hurt or trick him. Since he is a large animal who has been very badly abused, precautions must be taken to ensure that he does not hurt himself or others. Right now, Sunder may find it difficult to trust anyone, but that will change. Sunder’s planned transition is explained in this NDTV report. Today, BBP granted PETA permission to create a temporary enclosure in which Sunder can move freely and at the same time allow veterinarians to treat his injury. His injury is, however, massive and is just above a joint that will be hard to heal, but the veterinarians are working on it. BBP has also given PETA permission to build a 1.25-acre sturdy enclosure that can be used for male elephants when in musth (a period of sexual urge that makes them aggressive), where they can be kept chain-free (the traditional method in India is to keep them in chains during this time). This enclosure can be used at other times, too, such as for the gentle introduction of any other rescued elephant to the park before he or she joins the herd. Once he is thought to be psychologically and physically ready, Sunder will be transitioned to be with his new family, with whom he will be able to walk around freely. He has already met a few of those family members and was quite excited to see them. His loneliness and desire for the company of other elephants over the years, after being taken from his mother, must have been overwhelming. Shiva excitedly greeted Sunder, but since Sunder may not have ever seen a baby elephant before, he was scared. With the enthusiasm Shiva showed in making Sunder a new friend, it seems likely that the two will become playmates and best buddies in time. Other elephants in the park bathe in the pond and wander about on their own with their mahouts watchful but at a distance. Park officials have told PETA that the entire 49.5-hectare forested area for elephants will be fenced in to allow the herd of 13 elephants – which Sunder will join – to roam freely at all times except when they need medical treatment. We are beyond delighted to report that the much-abused young elephant Sunder has arrived at his new home, Bannerghatta Biological Park, where he is to reside by order of the Supreme Court of India. Park officials have assured PETA that the entire 49.5-hectare forested area for elephants will be fenced in to allow the herd of 13 elephants – which Sunder will join once he has settled down and his serious leg wound caused by long-term painfully tight chaining has healed – to roam freely. Veterinary experts are working to address this wound. We have also gained permission to fund a spacious 1.25 musth area for Sunder. Sunder has suffered greatly for years. He has a massive injury to his leg, on a joint that will be hard to heal. He has been badly beaten and otherwise abused and so will need to be introduced gently to a different way of being handled, quarantined for health testing and loosely restrained as his injuries and health are assessed and as he comes to trust his new caretakers. PETA continues to engage with elephant expert advisers in India and abroad in order to help with the transition. We have overcome immense hurdles – including unscrupulous behaviour, the deliberate dissemination of misinformation, attempts at religious blackmail, enormous pressure from sundry quarters, court battles and political corruption – during our efforts to rescue Sunder from the clutches of his physical abusers and mental tormentors. We are ever so grateful to every single soul who found a way to help and who joined the #FreeSunder campaign, thereby becoming part of this joyful outcome. More than 220,000 people from around the world wrote to authorities seeking Sunder’s release through action alerts on PETA affiliates’ websites. Many celebrities – including Paul McCartney, Amitabh Bachchan, Madhuri Dixit, Pamela Anderson, Arjun Rampal, R Madhavan, Gulshan Grover,Kapil Sharma and others – took to Twitter or helped in other ways to keep the spotlight on this long campaign for Sunder’s release. At one point, Maharashtra Minister of ForestsDr PatangraoKadam and the Project Elephant division of the Ministry of Environment and Forests issued orders for Sunder’s release, but those orders were ignored. Senior Counsel Shiraz Rustomjee and Counsel Rohan Rajadhyaksha won for Sunder in the Bombay High Court. M/s K Ashar& Co Advocates & Solicitors were the advocates on record for PETA for the cases in the Bombay High Courtand Supreme Court, and Senior Counsel Raj Panjwani won the case for Sunder in the Supreme Court. We thank Suparna Ganguly of the Wildlife Rescue and Rehabilitation Centre for her support of the campaign and MP Maneka Gandhi, who helped us greatly by using her significant authority to end the stalling. We also thank Naresh Kadyan of OIPA for trying to bring Sunder’s abusers to justice. We are also thankful to the Maharashtra Forest Department and numerous veterinary and other elephant experts for assisting with Sunder’s move to Bangalore, and to scientist Surendra Verma and animal behaviour consultant Margaret Whittaker for guiding us in other ways. Most of all, we would like to commend our hardworking staff and supporters who lost sleep, travelled between government offices, briefed lawyers and reporters, took undercover photographs andvideos of abuse or helped in other ways. The elephant care centre at Bannerghatta Biological Park sits in a wonderful natural forest with ponds and streams and willserve as a safe refuge for Sunder. It also has the potential to develop into a world-class facility. Sunder, a 14 year–old Indian elephant, is supposed to be living in a sanctuary. Instead, he is being chained and beaten. Undercover video footage just released by PETA India reveals a malnourished–looking Sunder, chained by two legs, writhing in pain and struggling to stand as a mahout (handler) strikes him repeatedly with a wooden pole. For six years, Sunder was chained and abused at the Jyotiba temple in Kolhapur, India, but the Maharashtra Forest Department and Project Elephant gave orders to retire Sunder to a sanctuary. Instead, Maharashtra Member of Legislative Assembly Vinay Kore, who had given the elephant as a "gift" to the temple, sent him to be chained in an old, dark poultry shed in Warananagar, near where this footage was recorded. government demanding the animal be set free. ↑Elephant statue at the Jyotiba temple in Kolhapur, Maharashtra, India. Maharashtra, India. Hayder is demonstrating the sharp metal spike, called an ankus, which he uses to control the animal. As you know, Animal Rahat works to free elephants from temples, where they’re used to beg for money and where they are usually chained 24 hours a day, unable to take even a single step in any direction. I have an update on Sunder, the 14-year-old elephant who, when we first discovered him, had been beaten so badly that his eye was injured. You may recall that last year, we launched an international campaign and got the government to order his release to a sanctuary. But then his owner secretly moved him, and no one knew where he was. shed at Jyotiba temple in Kolhapur, Maharashtra, India. temple elephant Sunder at Jyotiba temple in Jyotiba temple in Kolhapur, Maharashtra, India. ♦︎Sunder supporters outside the High Court of Bombay. 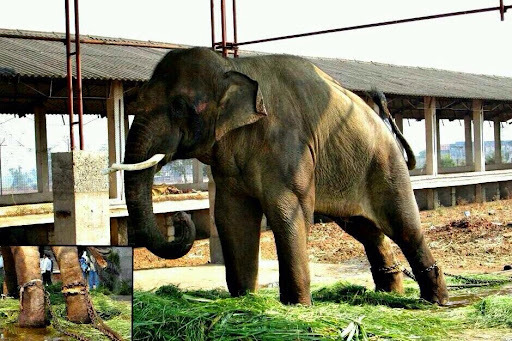 ↑★Free Sunder, elephant abused for 6 years in Indian temple! ★Petition to Ban ALL Temple Elephants in India and Stop their Abuse and Torture!